Monday means endurance day for the 60-girl-strong Girls Gotta Run team. School lasts half a day, and kids go either in the morning or the afternoon as assigned, so the girls attend one of two daily practices at whatever time of day they don’t have school. Those attending this morning’s practice meet in the middle of town to walk to the eucalyptus forest, today’s training location and one of several places the team frequents around Bekoji. Most walked and a few may have light jogged the distance from their home to downtown in the first place, which for many is at least a mile, and from there it’s two more walking miles to practice’s location. Now at the forest’s margin, Coach Fatia Abdi welcomes them–her brow furrowed in seriousness but her eyes filled with love–and gives the workout’s instructions. Then, the girls head into the forest. 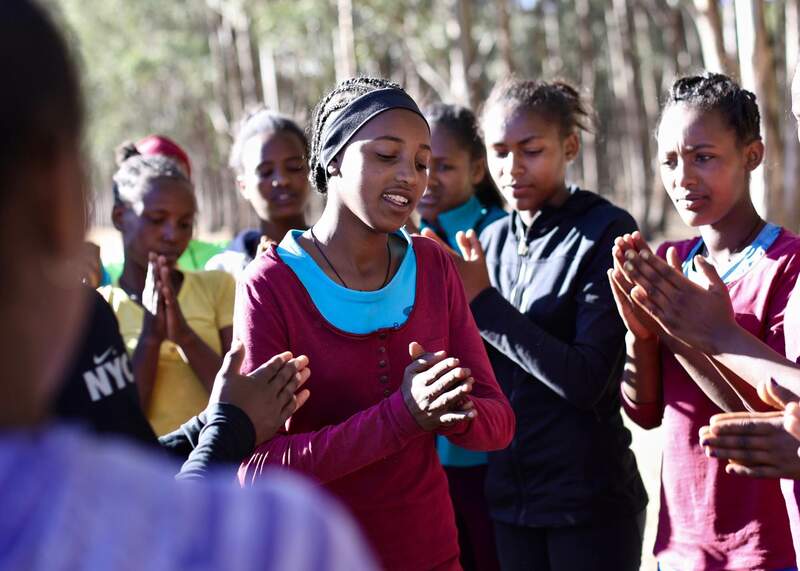 Quickly, the 25 or so girls split into three groups and begin easy running through the forested flats. In here, there is no trail or road or specific route to follow, but one girl leads each group and the rest form tight trains behind her. Eventually, the groups head toward where the forest floor pitches up steeply. They route upward, but in a super-meandering manner, fashioning their own switchbacks as they climb. Each group’s pace, even the group containing the fastest girls, is slow and easy, yet their footwork is sharp and their stride rates swift. Their faces are calm and, while some girls chat and giggle, others run silently. Finally, the thick eucalyptus forest breaks open to some sort of sparse, stubby evergreen trees, and then even those yield to just grass. For a moment, the girls gather on an open knob, waiting for everyone to arrive. As they stand here, their breaths condense into the chilly, dry, high-altitude air. The sight of their breaths is exquisite whilst lit up by the long sun rays, but it’s also beautiful for the way it tangibly represents the processes at work inside their bodies. Once everyone arrives, the girls dive off the grassy top and into the remnants of some sort of quarry. It’s steep, loose, and there’s no trail, but they drop in with ease, arms wide for balance. Circumnavigating the deepest part of the quarry, they head back into the forest, again zigzagging the trail-less terrain back toward where Fatia awaits them. Only for the final few minutes across the flat earth do they pick up their pace, little by little until they are going pretty hard. They bust out from the shade to the sun and come to a full stop, the margin of the two their finish line. Together, the team cools down through a series of drills that they know by heart. After that, one girl leads the group through stretches. As is tradition, the girls huddle up for a few minutes of quiet singing and dancing before bending at the waist to a moment of prayer. Practice ends as the girls line up to exchange double low fives with their coach. Oh yeah, that and the more-than-two-mile walk back home from practice again. 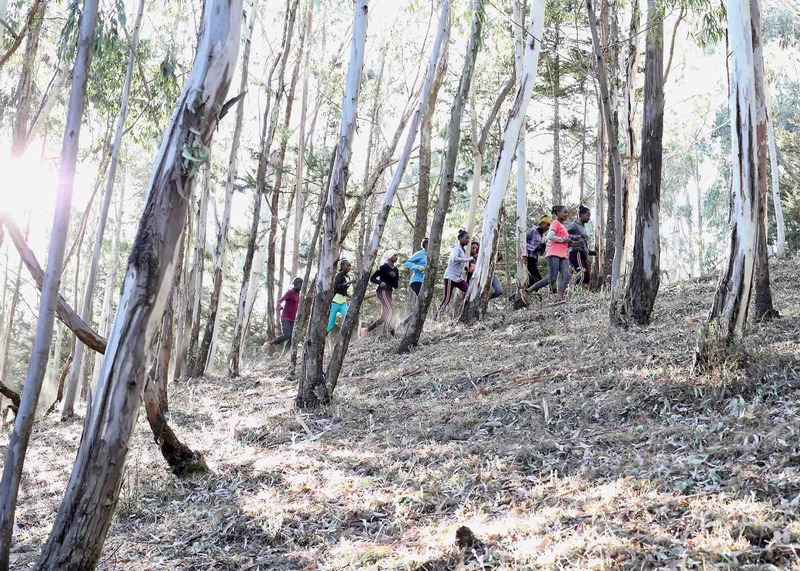 Climbing off-trail through the eucalyptus forest during an endurance-based practice. Coach Fatia Abdi speaks to the team ahead of a speed workout. The Girls Gotta Run team in a field at the edge of Bekoji. The Girls Gotta Run team has a regimen of drills for before and after their runs, as well as a post-run stretch routine. Every Girls Gotta Run practice closes with a couple quiet, intimate minutes of singing and dancing.